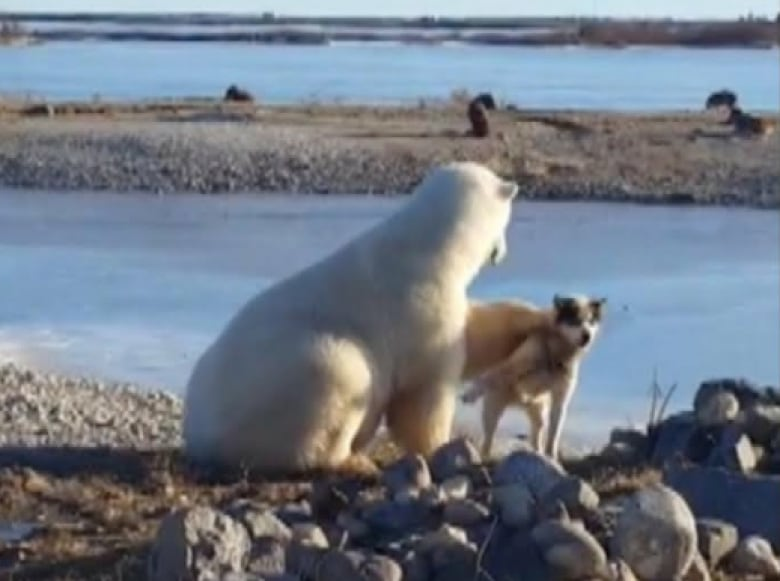 The actions of a northern Manitoba man whose dogs' odd bond with polar bears went viral are being questioned after one of the Arctic predators killed and ate a sled dog. A video posted online over the weekend showed a polar bear gingerly patting one of several sled dogs chained up on Churchill resident Brian Ladoon's property. A Manitoba Sustainable Development spokesperson told CBC News that conservation officers removed three polar bears from Ladoon's land last week. "Conservation officers had to immobilize a bear in that area last week and move it to the holding facility because it killed one of his dogs," the spokesperson told CBC News. "A mother and cub were also removed because there were allegations the bears were being fed and the females' behaviour was becoming a concern." Ladoon, who runs the Mile 5 Dog Sanctuary in Churchill, told CBC News that one day last week there were nine bears on the land where he keeps his dogs chained up. One of the bears ate one of his dogs, he said. "That was the only day we didn't feed the f--king bears, the only night we didn't put anything out," he said. Under Manitoba's Endangered Species and Ecosystem Act, "No person shall kill, injure, possess, disturb or interfere with an endangered species, a threatened species, or an extirpated species that has been reintroduced." In cases where someone is caught feeding endangered species such as polar bears, "failure to cease the action of feeding/baiting polar bears will result in further enforcement action," the Manitoba Sustainable Development spokesperson said in a statement. "The protection of polar bears is of utmost importance and interfering with their natural behaviour will not be tolerated." Ladoon said he takes "care of bears" and admitted he has been "charged with everything...under the book" related to his dogs. He told CBC News he takes tourists out to see the roadside attraction for a fee. 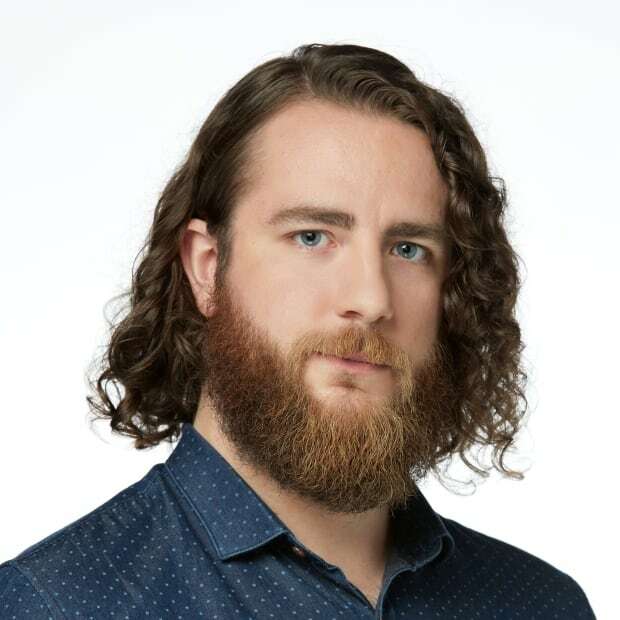 Ian Stirling, an adjunct professor at the University of Alberta, said Ladoon shouldn't be allowed to keep his dogs chained up outside in polar bear territory. Stirling, who worked for Environment Canada for more than 40 years studying wildlife in the Arctic, said the bear that killed one of the sled dogs last week was probably "thin and hungry." "The dog was chained up and they're totally vulnerable," he said. "Inuit [hunters] over the years in the high Arctic have told me that if you want a dog to act as a guard dog, you have to leave it off a chain. Because if it's on a chain it knows it's vulnerable and it won't bark." Stirling said what appears to be friendly relationships between Ladoon's dogs and polar bears is artificial and would never happen in the wild. "Any situation that brings bears in to feed in an unnatural situation in association with human beings, I think, should not take place at all," he said. David De Meulles, who filmed the viral video, said the dog in that footage was not the one that was killed by a polar bear last week. Stirling said it's possible bears that learn to associate dogs and humans with food could get in trouble down the line. If they encounter other remote northern communities while out on the Arctic sea ice, Stirling said polar bears might try to enter them and get killed by locals out of safety concerns. "It's basically a death sentence for the bears," he said. Ladoon previously characterized the relationship between the dogs and bears as "nature's will" and took issue with Stirling's interpretation. "It is unnatural? No. It's a phenomenon," he said.